Today is my dad's birthday. He would have been 68 years old. I miss him so. In remembrance of him, I would like to give away a set of my mini french bread boards together with the long french bread board to one of my wonderful readers. My breadboards are my way of honoring him so I thought what better way to celebrate his birthday. I love my readers and shop customers and appreciate you all so very much! To enter this special giveaway, all you need to do is leave a comment below telling me your favorite Fall memory or tradition. That's it! Comments will be closed on Sunday night (October 20) and a winner will be randomly selected and announced Monday morning October 21st. 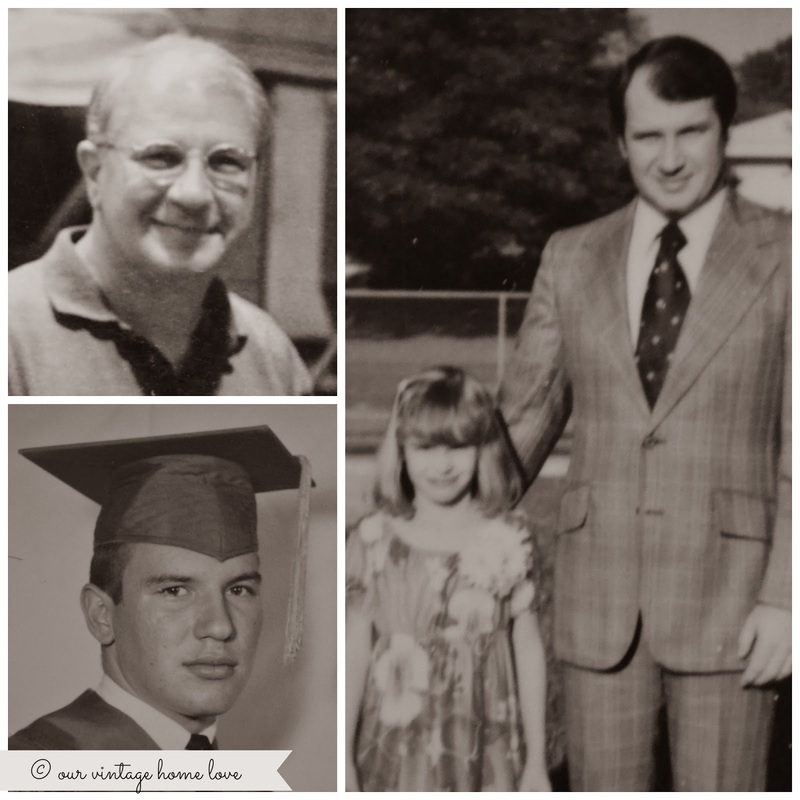 What a sweet and special way to honor your dad and celebrate the wonderful things he taught you! My favorite fall memory -- when I was growing up in Tennessee, every October a big group of my family would head up to Gatlinburg and stay in a cabin together for a week, watching football, cooking, shopping, and staying up late just enjoying each other's company. Those trips are my favorite and most vivid memories! Tailgating with yummu food and watching football games! Hi Diana - my Dad would also be 68 but he's not with us for 27 years :-( In my country in Fall we have a special day to honour all the people that have gone and although it is rather a sad celebration I need it and I love it. And my favourite memories are going with my family (when I was a child) to the forests and collecting mushrooms which we then dried or put in jars. Yum!!! My husband passed away 2.5 yr ago; his daughter lost him at age 62. Way too young for both these guys. You have my sympathy. I like bringing fall color into the house. I love the smell of the candles, the oranges, greens, yellows, etc. I love fall - even tho I live in Minnesota and know that it is the prelude to many months of winter!! Thanks for the opportunity to win this gift. Awesome! This is a very sweet idea and such a lovely way to honor your Dad. My favorite fall traditions are going on hikes with my family and coming home to hot cider and cocoa. I love this. What a wonderful way to stay connected to him—through making beautiful, useful things. My favorite fall tradition has become going to the pumpkin patch with my son, who is now 5. He has each of us pick an appropriately sized pumpkin (Daddy's is the biggest, then mommy, etc.). This year we'll be taking his baby brother for the first time. What an amazing way to pay tribute to your Dad! One of my fondest Fall memories is getting up EARLY with my Dad on Saturdays, before anyone else go up, for our Daddy/Daughter pancake breakfasts. We went to this cute little diner in NH (where we live.) When I close my eyes, I can still see that small main street as it looked out the diner window 40 years later! What a beautiful gesture. I think my kids will always associate homemade bread with their dad because my husband is the bread maker in our family. Our favorite fall tradition is apple picking. Our favorite spot is a simple orchard with no carnival type atmosphere. Over the years, we have loved to pick many different types of apples, and then have apple tasting contests to see what our favorites are. The winners seem to be Jonathan and Empire. This is so kind of you Diana! I love getting together with family and standing around a fire. We always do this in the fall season and it always results in great stories. My favorite fall tradition is doing a farm crawl through the local farms around my hometown. They do it every fall and each farm showcases a different item.One farm has honey and eggs, one has apples, pumpkins/gourds, goats milk, etc. My family does it every year and we love being out in the crisp air all day sampling, learning and purchasing these great items. My favorite fall tradition is making apple pies for my family. Your bread boards are lovely! Grandpa always drove the combine and I would ride with him for hours! I miss him, too! how sweet of you. i am sure your father is missing you too. fall is my favorite time of year and so i have tons of favorite memories. i think one of my favorites is just from a couple years ago. we are farmers and my son has always had an interest in helping his dad. my daughter on the other had was always involved in extra cirricular activities in school and rarely helped. well that all changed a few years ago and she began helping as much as she could. nothing gave me greater joy then to look out in the field and see my husband unloading grain into the cart that she was driving and then she dumped into the truck my son was driving. all 3 of them working together. priceless. my favorite fall memory is apple picking with my own parents every fall as a child- i loved it! we would climb in the trees to pick! such a sweet way to honor your dad. My husband like to be outdoors when the weather is nice, but really just can't sit down and relax for very long. Fall at our house is when he begins to mull over a Fall/Winter 'indoor' project. Past projects include painting our old brown buffet turquoise with me doing the aging; laying hardwood in our house; redoing our master bath, including wiring in a tiny chandelier over the big tub; adding crown molding where there previously was none... in the entire house & last thanksgiving, glass tile backsplash in the kitchen. Happy Fall, y'all! What a wonderful way to honor your father's memory! My favorite fall tradition is going back to Virginia Tech as an alumni and cheering on the Hokies! We try to go once a year, and it's always SO much fun to see how much the campus changes. It's a beautiful part of the state, so I love seeing the leaves change and driving through the mountains too! What a wonderful way to honor your father's memory. How sweet of you! I love love Fall. Every year I take my kids into the woods in search of pretty leaves. Bring them back home to iron between wax paper. The kids love it! I just love Fall, the changing leaves, the smell of wood burning in the air and crisp mornings and nights! My parents got married when I was in middle school. Ever since then we have had the whole family together for Thanksgiving. I am the only girl with a brother, a husband and four guy cousins! It's so much fun and we have more memories than I can count. It was the first time I had ever had family together for the holidays. Everyone spends the night so our Thanksgiving turns into a three day get-together. !e go to a coffee shop Friday morning and then shopping at the locally owned stores since my parents live in a small town in Northern Minnesota. We play games, play records, go for walks, and most importantly laugh, laugh, and laugh. Thank you for making me take the time to appreciate the family my Dad shared with my Mom, Brother and I. Happy Birthday to your father, may he be smiling down on you and all of the great things you have done! My favorite fall memory is when we lived in Ann Arbor, MI and went to Dexter Cider Mill for hot out of the oven cinnamon sugar donuts and apple cider on cool fall morning on the weekends with my husband and two sons. It was always so beautiful and serene there in the fall. What a great way to honor your daddy! Fall is my favorite time of the year and reminds me sooo much of my dad who we lost this past February. Every Halloween he would come over to hand out candy so that my husband and I could take the kids trick or treating. This will be the first year without him here. Makes me so sad. My oldest son wants to take over the tradition :). Thank you for sharing - be blessed. My favorite fall memory is raking the leaves in our yard into piles so we could build "houses" out of them. It was so much fun!!! What a great way to honor and remember your dad! Every fall my family would go to Montauk for a weekend trip. It was always so nice to be there when the summer season was ending and everything was getting quiet. The foliage was always so beautiful and we were sure to always get plenty of hot chocolate all throughout the weekend. I looked forward to this trip every year. Thank you for sharing with us, you came up with such a nice way to honor your dads memory! My husband passed away 15 years ago at the age of 36. Our boys were 7 1/2 & 9 at the time. We would always rake leaves into piles for the boys to play in. And carve pumpkins together. As the boys are grown now and don't jump in the leaves, we still carve pumpkins together every year. I know this day must be hard for you. I think it's a wonderful thing to do something in his honor. What a coincidence, my Dad's birthday is today too! He turned 81. I guess my favorite Fall tradition has been taking my kids trick or treating. Although, I only have one young enough to still do that now. I guess that is what I think of most during Fall. Plus.....my own birthday is on Halloween too. I am new to your blog. How sweet to honor your father and remember him by sharing. This past Saturday my mom has been gone for 9 years, in three weeks would have been her 67th birthday. Fall was her favorite time of year as well as mine. My teenage girls love this time of year as well. Living here in Florida, it is such ananticipated time of year...it means we will soon have a break from unbearable heat. We do not get the beautiful colors that Fall brings to many parts of the country, but us Florida natives do see a Florida Fall. Thanks for sharing about your father. Growing up our church would have a hayride that started at one of the members farm. We would drive through the country roads for 2 hours looking at the stars, singing, talking and laughing. Then we would have a bonfire afterwards. They had to sell the farm a few years ago because they couldn't take care of it anymore but it was my favorite thing every fall! Every year my boyfriend and I gather our friends at the local winery and make a day of it. We drink wine and walk through the apple trees and grape vines while admiring the surrounding fall foliage. Before we leave we pick some pumpkins, bring them back at our place to carve, while we eat a potluck meal and sit around the fire listening to music. We always look forward to this fall day! Happy Birthday to your dad! I'm sure he's smiling down upon your family, proud of everything you do. My favorite fall tradition is Thanksgiving. I absolutely love getting together with my giant family and spending time with one another - the food's not too shabby either! Thanksgiving is truly my favorite holiday and I'm so excited to spend it this year with my new baby boy! He's going to have a blast trying all the food!! We were just talking with friends last evening about how we are almost the ages of our parents when they passed away, and young that was. My dad died at age 68 and here I am 62. I don't feel old at all. A favorite fall memory from years ago is visiting Bemidji, MN, and walking through the most colorful woods I had ever seen. The leaves crunched underfoot so loudly that we couldn't hear each other talk! Hope you're remembering happy times with your dad today. We have a fall "doughnut party" every year...one night when we gorge on lots of homemade doughnuts! It's coming up this Sunday; I'm so excited. What a beautiful way to honor your Father's memory! I love fall so much. Growing up a farmers daughter meant our fall was busy with the harvest. My mom would make huge meals and lots of fresh baked goods. We would package it all up and take it to the fields for my dad and grandpa. Absolutely loved to help her. Loved even more seeing my dad and grandpa enjoying the fresh goodies and taking a much needed break. Absolutely love Fall! My favorite fall memory is every year when Starbucks rolls their pumpkin spice lattes out and I can officially begin eating anything and everything pumpkin! We love to take our kids out side, they pick their fav leaves and we make bouquets for decoration. We also sit around the table and peel apples to make hot apple cider and chunky apple sauce! The house smells AMAZING! I love Fall! Such a sweet way to remember your Dad! My favorite fall memory...well...during this time, I always start burning Mrs. Claus' Kitchen. I know the name of the candle refers to Christmas, but for me, it just invokes a small smell of baking on a crisp, fall day. My kids LOVE the smell and everyone who walks through our front door always comments on how good it smells in our home. Love fall. How sweet to honor your dad! My favorite fall memory/tradition is spending time with my family in Door County for Fall Festival (where I am heading today!). We have apple crisp, drink wassail, and spend time together with cousins, parents, and grandparents. It is such a treat. What a sweet way to remember your father! I love the pictures of him, and I assume that's you in the one! Corn mazes, pumpkin picking, hayrides, face painting, and apple cider with my family! I love picking apples and going for long walks outside! I love it when my niece and nephew come over to my house on Halloween and help me pass out treats! What a generous give away! My favorite Autumn memory is sitting on my husband's grandparent's porch in the country on Thanksgiving weekend, sipping cider, just three months away from the birth of our first child. Taking a fall walk and hearing/feeling the leaves crunch beneath your feet. This is such a wonderful idea to honor your father. Your bread boards are beautiful! Autumn is my favorite season and I love to walk through the woods with the dogs and my partner and admire the beautiful colors of the changing leaves and then enjoy some hot chocolate or hot cider when we get back. We live on 80 acres and most of it is trees (we call it "the timber"). I also have wonderful memories of carving pumpkins with my parents when I was a kid, though we don't always do that anymore as we don't have kids of our own. I love everything about fall....the way the shadows are longer, the cool, crisp feeling in the air, the beautiful leaves, the pumpkins, apple cider, my birthday. It's all wonderful and I wish it lasted longer. I love, love, love you breadboards and would be honored to have them in my home! I hope you have a happy day remembering your wonderful Dad. Where I live, fall and Easter coincide. We used to go camping on the beach at Cape Vidal or Sodwana Bay and my father used to rig up the most amazing shower for us so we could rinse the salt water off. A very sweet way to remember your father. Fall is my favorite time of year, I love all the traditions I am making with my own children, although finding a pick your own pumpkin patch in Germany has been challenging. What we love the most is going hiking in the fall, a way that I honor my father. He loved to hike, especially in the fall, and would always have me stop and breath it all in, the smell of the leaves, the beautiful blue skies as a backdrop to the bursts of orange, yellow and red. What a sweet way to remember your father! Fall is my favorite season..so many special memories and celebrations! I lost my "DaddyKeith" my grandfather three years ago in October so this month always holds a special place in my heart in remembrance of him! I also started dating my now husband (8 years ago) in October so that is a sweet memory! My favorite thing to do in October is go camping and make s'mores! I remember raking walnut leaves and then burning them. they have a smell that is uniquely theirs. now we can no longer burn anything so I miss that smell. I lost my Dad at any early age too and I still miss him. My favorite fall tradition is taking my grandson to a local farm for pumpkin picking! We ride the wagon out to the patch, pick pumpkins, and then head home for pumpkin carving! After dinner we always watch The Great Pumpkin! My favorite fall tradition is a thanksgiving tree. Every year we circle up as a family and place strung cranberries on a small branch stuck in a can of dried beans. As we place the cranberries on the tree we say something we are thankful for. We keep the tree with cranberry "ornaments" up for several weeks, reminding us how much we have to be thankful for! Fall means bonfires, warm soup and cozy sweaters! Hay rides, pumpkins and carmel apples are what my kids love! Now all we need to add to the tradition is breadboards for some ymmy crusty bread to go with our soup! Wishing you peace on this special day! My favorite fall memory is picking apples at the local orchards! My favorite fall memory is going on hayrides and bobbing for apples. What a beautiful gesture of grace. I miss my dad so much also. He died at age 62 so I truly understand your loss. One wonderful Autumn memory was when my dad raked the leaves into the street in front of our home. He then sent us into the house to get potatoes and aluminum foil, butter and salt. No kidding. We wrapped the potatoes in foil with salt and butter and threw them in the leaf pile. My dad then started burning the leaves with the potatoes in them. After the leaves burned, we picked out the potatoes, took them in the house, unrapped them and ate them. The taste was fantastic! It makes me smile today to think we thought that was so cool to do! Taking the grandkids pumpkin picking and hayrides. My favorite fall tradition was going to the Cidar mill, getting fresh cidar, and homemade sugar donuts. Fantastic! What a lovely way to honor your dad. My favorite fall tradition is going apple picking with my family and then baking apple crisp when we get home. When fall comes at our house, it's time to start making homemade soups. I also love getting out the fall decorations, the wreath for the door and buying the pumpkins for the porch! What a wonderful way to honor your dad. My favorite fall tradition is Thanksgiving because the entire family is together and my birthday is the same weekend... My mom will make a cake and everybody will sing to me.. extra special! We are a few years into the tradition of making homemade cider which hopefully my son (and future siblings) will remember about fall when they're grown up. Every fall I can't wait to make pumpkin chocolate chip bread! I've loved everything fall for as long as I can remember. I love opening up the boxes of fall decor and smelling the pumpkin candles. I love decorating my home for fall... it always feels so cozy and comfortable. Now that I have children, we've also started visiting the same pumpkin patch every year. My children look forward to carving those pumpkins all year long. Fall is just the beginning of a wonderful holiday season. I love carving pumpkins and visiting local corn mazes with my daughters. As they were growing up, the pumpkins changed from very simple to elaborate. Recently my family has started a new fall tradition, where we visit a local apple orchard, pick apples, and have a picnic lunch. We then come up with creative ways to use our apples, baking, in salads, and different dishes. It is a fun way to kick off our favorite time of year. Our favourite fall tradition is apple picking, we started before we had children and continue to do it every yr, the kids really look forward to it! Thanks for the great giveaway and hugs to you! What a wonderful way to honor your father, they're beautiful! My favorite fall memory is taking our 4 children apple picking to the same orchard. We started when our oldest were 21/2 & 1, we kept going until finally they had jobs & felt too old. My daughter took her oldest at 2 when they lived in Conn. then they came up here (Maine) with 2 children the next couple yrs. 2 years ago her husband was stationed in Georgia. As soon as fall came she wanted to go apple picking. Nothing within 60 miles. She came up last month for her best friends wedding, she, the now 3 children & Grandpa went. She said it felt like home. Going to Indiana with my dad and older sister to get apples was an adventure I still remember. Dad worked two jobs and there were six of us kids. Having time with Dad was always a special treat. My dad is also gone now so I can truly sympathize. I love that you make the boards to honor him. My dad loved language so when I write I feel closer to him. I, too, miss my Dad and Mom...everyday. Great way to remember and honor your Dad, love it and love the breadboards. My favorite Fall tradition is just decorating for Fall...both inside and out...besides Christmas, I think Fall is the best!! The oranges, muted reds, browns...yellows they are all wonderful!!!! This is such a sweet giveaway! My favorite fall memory is harvest time. Growing up on a farm, and now having one of our own,we appreciate fall time! The hard work we all put into preserving the years crop is a memory I've had since I was a young girl. That favorite fall memory would have to be playing in the leaves with the whole fam plus the overexcited puppy! Love your bread boards. I understand that missing your dad....it never ends. Blessings! Awesome idea! My favorite fall tradition was taking family pictures by the river with all the changing colors and beautiful trees. We would pick up something for a picnic and just hang out for the evening. Those were good times! My favorite fall memory is Thanksgiving dinner with my family as a child. I remember it as being the only meal we could all agree was our favorite. Sadly we lost my mom 6 years ago, and with it those turkey dinners. It took me a few years to enjoy thanksgiving again and have finally started cooking that same meal, but for my kids and family. It now feels like my Mom is with us in some small way at Thanksgiving. I always enjoy our Halloween tradition of going trick or treating. We would stop at family members and friend's homes and they would have baked goods and fruits for us, along with candy. It was fun to visit and show off our costumes. Then after we got bags of candy, we would go home to watch scary movies and eat our treats. We used to go to a little farmstand for pumpkins n mums that had been around forever. By the time I moved back to the area after college, it had closed. I get to drive past it most days on my way home though and it always makes me smile to think of my brother and I climbing through straw-bale mazes n forts while my mom perused the goods. Easy..racking up all the colorful leaves then climbing the tree and jumping into it! So many fall memories to choose from, but one of my favorites is from my early childhood. The large trees in our front yard would rain down piles and piles of dead leaves each fall. With a rake taller than me, I would work for hours to gather the leaves into one large pile. But what did we do before we moved the leaves to the streets? My brother, sister, and me would build tree "forts". Leaves weren't very effective at building walls, but we would build forts and mazes and jump around, almost creating a bigger mess than we started with. Well this is not yet a memory or tradition but to me it will still be the best. This year me and my wife get to spend our first holiday season with our handsome, awesome, unbelievably amazing first born. He might only be 4 months old but he has changed our lives and hearts forever and I could not be any more thankful for being able to be apart of such an incredible miracle. This by far will be the start of a lifetime of memories I can't wait to be apart of!! What a great way to honor your dad :)! Being from the South -- also known as football country-- and not being a big football fan myself, I learned to take full advantage of when we had a 'home game' and spend that time going out & enjoying the trails. I love hiking & being in nature, and prefer to do it without a ton of people. And since Fall is also a big tourist time in my area (east TN), it can be hard to find a weekend when there aren't a million tourists everywhere. So spending time in the mountains on home football days is a Fall tradition I started early, and continue now as often as I can. I don't have many fall memories from my past, however I am certainly making new memories with my kids. I love putting up all the decorations-the boys even get involved-although they do a lot sitting and moaning...haha! That's fine with me because when it's done we've had laughs and certainly enjoyed the time together. I love everything about fall! But celebrating the birth of my youngest son is by far the best. What a wonderful way to honor your father. I miss my father too. Your bread boards remind me of the fact he loved to bake his own bread. In the fall he made the most killer grilled cheese sandwiches with his own bread. (they'd be called paninnis now!) I still cannot duplicate them and believe you me, I have tried!! Thanks for the giveaway! My favorite fall memory is going to a local cider mill with our children when they were young. Tasting the wonderful homemade cider as well as some really delicious donuts, and watching their faces covered in cinnamon sugar while they watched the apple presses is something I'll always treasure. Thanks for the chance to win such an incredible gift. What a great story about your dad! My dad's a carpenter but still with us. I love your idea of honoring him by trying to make your first breadboards. My happiest fall memories with my parents are our annual trips to the local pumpkin and apple farms. My dad knew all the windy, bumpy backroads to get there and show us the gorgeous fall landscape along the way. The years that we haven't been able to go, I've missed that time together. I hope to start that tradition again with my own kids. Thank you for blogging about your memories! Such a sweet way to honor him, and so nice of you to do so. I don't have a favorite fall tradition, but I love fall foods with all my heart. The stews and roasts and salads and muffins this time of year make me giddy. We're still not finished with our kitchen, but the counters are finally being installed tomorrow and once we have water again, you won't be able to get me out of the kitchen!!! I don't think anything beats jumping in leaf piles! My parents house didn't have many trees, but my grandparents did. So lovely, lying in a bed of leaves! Going to a local fall festival, trick or treating and jumping in big piles of leaves are the best memories I can come up with from my childhood. Making new fall memories with my 3 boys now! Thank you for sharing about your father. I miss my father as well. But my father loved the mountains and we would take day trips or camping trips to the mountains in the fall. We would go hiking or visit apple orchards. Now with my family, we love to take time to make pumpkin cookies and carving our pumpkins then roasting the pumpkin seeds. Now as the boys are getting older, they invite their friends over to share in the fun. What a lovely way to honor your father. I'm sure he was a special man. My best memory is piling up leaves as high as I could and falling backwards into them. What a lovely story about your father. Oh fall...where do I begin, trick or treating, pumpkins, fall & halloween decorations, Thanksgiving, the smell of pumpkin candles, pumpkin pie and being able to share it all with my daughter and my Mr.
My favorite Fall memory is of Thanksgiving morning. My mom would be busy in the kitchen while my dad and I watched the Macy's Thanksgiving Day Parade on TV. This year will mark my first Thanksgiving since his passing and while I'll miss him on that day, as I do each and every day, I look forward to sharing the tradition of watching the parade with my two girls. Trick or Treating with my sister! My favorite fall tradition was meeting with my mom's side of the family. Before she died, my grandma owned a 120 acre farm, and my aunt always had a few horses at my grandma's for the season. As a kid, it was such a joy to spend hours riding outside, and to be a nuisance and generally underfoot inside as the bread, turkey, mashed potatoes, stuffing and pumpkin pie was cooking. It was a modest dinner cooked in a tiny kitchen, but it was the best tradition we had. Riding in the combine with my dad! My favorite thing about fall is the 'nesting' urge that comes with the change of weather. I grew up running a roadside farm market with my folks, and those days ended when my dad passed away. It was a 24/7 lifestyle but the best in so many ways! I miss my dad so much still. A very Happy Birthday to your dad. This is a wonderful way you are celebrating and remembering him ! I have been in this country for just 3 yrs now and fall is definitely a very special season .. the season of enchanting colors, where a fallen leaf is also so beautiful. I love collecting varied size and colored leaves with my daughter. Its fun dressing her up for trick or treat, the pumpkin carving and umpteen cups of ginger tea to beat the weather ! Favorite fall memories......where do I start? Autumn has always been my favorite season......the colors, scents, food, first fire, sweaters, band competitions, football games. My husband and I started dating in October during our university's homecoming. My dad passed away one November and I was worried that it might sadden it for me but it has only added a sweet layer of emotional connection to this 'special' time of the year. I just gave my daugter a baby shower at a pumpkin patch. She is expecting her first child tomorrow actually. It is going to be a boy! This is the first boy born on my side of the family since my late Father was born over 80 years ago. Everyone else has had girls. So this year and from now on our favorite Fall memory will be a birthday party for Quinn hopefully at a pumpkin patch every year. I think I understand how you feel about your Father, I feel the same way about mine. I know he is watching down on us as we await the arrival of this special boy. I know this is not a memory of Falls past but it seemed important to say today. Fall memories are wonderful, my best memory is of my daughters wedding, it was beautiful weather and the perfect Midwest weekend. Thanks for the giveaway , and I am missing my Dad too. Everybody is right, this is a great way to honor your father. My favorite fall memory is the year my husband and I (still boyfriend/girlfriend then) lived in Colorado. I have lived in Florida my whole life and never saw a fall. I was so excited to see it and decided that the perfect place to really expierience it was in Aspen. We drove 4 hours to Aspen and did not see a single gold, yellow or red leaf anywhere! Turns out the snow storm that had hit a month earlier killed everything and the best place to see fall foliage according the paper the next day... was the city. Lol oh well. Someday I will see it! That was 18 years ago, and I will never forget it. My mom, sister, and all of our kids (all girls) take off work and school one day in the fall and do a girls day traveling to a couple orchards and pumpkin patches near our house. We carpool together singing and talking, explore the orchards/patches, eat lunch, and just enjoy the day being together outside. We've been doing this since I was in elementary school when it was just my sister, Mom, and I. It's even more special now to share it with all our daughters. Gotta love burning a spice candle and snuggling with the family!! My favorite tradition is gathering chestnuts in our yard with the kids. Mostly we use them for decoration. The kids love gathering them up in buckets. It's a true sign of fall. My favorite fall memory is of my freshman year at college. I had moved about 6 hours away from home and had not been home since school had started in August. My birthday is at the end of September and my Mother brought me my favorite homemade cake and some apple cider from an apple orchard near our hometown. We, along with one of my new friends, went to the local lake and had a birthday dinner along with Mother's cake and apple cider. I love the pictures you shared of your Dad. He seemed like a very special Dad. So kind of you to be sharing your bread boards in his memory. I actually have 2 Fall memories from childhood. Being of Italian heritage Fall always started on Labor Day Weekend where the whole family would get into a very large car and go out to visit farmers and purchase many bushels of tomatoes. Then we would start the process of canning and preserving them. My second is on Canadian Thanksgiving, where we would have another opportunity to get together, but this time it was to make wine. Lots of jolly uncles!!!!!!! Very sweet way to honor your dad. One of my favorite fall memories was picking apples in our backyard for pie making! I lost my Dad recently too, and I miss him especially during this holiday-it was his favorite. Thanksgiving to him is about family and friends and being together-not the commercialization of every other holiday. (So that's one of my best memories) Even if I don't win your breadboard, I have to say that I truley enjoyed reading all the posts. What a fabulous group of people! Very nice of you to honor your Father this way. My favorite fall memory is carving pumpkins with my 4 children. We would line them up and down our back sidewalk lighting them every evening with candles until they got pretty sorry looking. So nice! Our favorites are pumpkin patches, leaves, and treat making all with our kiddo's! My father died in the fall so it is truly a bittersweet time. Here in Canada, we have just celebrated Thanksgiving, always a lovely time with the fall colours. Fall meant back to school and resuming the biweekly weekends shuffle between my divorced parents. We couldn't do very much with our friends over the summer or on weekends because of the visitation arrangements. During the 2 hour rides, my mother would try to cheer us up with stories. Today while I was taking pictures for my blog, a memory came out of nowhere. She would tell us that the trees were dancers, swaying their long arms in the wind. Autumn meant putting on their fancy party dresses and celebrating for just a short time before they rested over the winter. She told us that we should remember that nothing lasts forever, not the display of colors on the trees and not even the painful goodbyes when she had to drop us off. I cried in my car today at the thought of a mom with three little girls trying to explain such a difficult time. It doesn't sound like such a great, happy memory, but we learned to cherish the time we had, to look forward to the first hints of crimson on the trees and all clapped excitedly during a windy day. I am so sorry about your dad. I don't know who I would have been without my mom. What a sweet giveaway! My favorite memory is going to a pumpkin patch and drinking apple cider to warm up. It's fun to carry it on with my kids. My favorite fall family tradition is EVERY year, my whole family goes apple pickup in upstate New York. We go to an orchard that you can drive your cars (or trucks!) right in the orchard. We make a pikick and BBQ. We used to be the kids running around, but as we've grown older, its our kids. This is such a thoughtful giveaway! Our favorite fall event is going to our local pumpkin patch with our kids. It's fun to go to the same farm so our pictures show just how much our kids have grown every year. We love fall, just wish fall weather lasted longer! My favorite fall memory is the first cool morning air. How fresh it smelled. Very sweet gesture for your dad. My husband and I started a new apple picking tradition this year. I also love decorating our porch. Great way to honor your dad! We always head up to our camp and have an apple fight with all of the dropped apples(we have tons of apple trees). It is something I hope my kids will always remember. What a lovely way to honor your father...my favorite memories are of family apple picking times...and raking leaves! What a sweet idea. My favorite memory is jumping in leaf piles with my little girl, just like I did with my mom when I was little. I love your bread boards and the story behind them. What a special way to honor your father. A favorite fall memory is of taking long walks with my family and enjoying the sights of smalls of fall. Hi Diana. That's so nice of you to do that. Your breadboards are so pretty. Plus I love your home! Pretty much in October and November we watch Michigan football every Saturday! Go blue! I would have to say jumping in the leaves as a child and the way they smelled as my Papa burned them afterwards. My favorite fall memory was going to a nearby farm with my family called Old MacDonald Farm. They had everything you could want to do in a fall family outing: pumpkin slingshots, corn maze, hayride to pick out pumpkins, petting zoo, gem mine, huge slides out of the barn and so much more. Such a fun tradition to start for our family! Thank you so much for sharing your projects around the house with us. I have loved getting inspired by what you've done. My favorite fall memory as a child was jumping in a pile of leaves. Making leaf piles with our son! My husband and I were married the first day of fall - it's our favorite season! My husband and I met and fell in love on a slow rainy Oklahoma day in October. We cherish those days and even now we are sure to take time to spend those moments together. 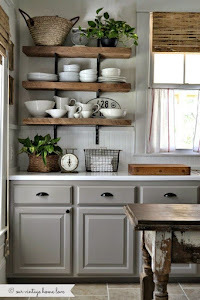 I enjoy your blog and I like that you share your DIY projects. Firstly, what a special way to honor your Dad! Also, as a side note, I am such a fan of your handy work- so inspiring! Growing up, every fall my family went to the apple orchard to pick bags upon bags of apples. Aside from the usual apple-baked goods, my mom also specifically added applesauce to the list, which we would immediately make after arriving home from the orchard. We all had a job: my mom peeled the apples, my dad cored the apples, and my sister and I chopped them up (sneaking some bites in, of course ;) ). My younger cousin, who is like a brother to me, eventually joined in on the annual fun as well. Now as adults, my sister and I still make the trek to the orchard with our own families, and then head to Granny's to keep the tradition alive. Best applesauce I've tasted to date! fall reminds me so much of projects and activities in elementary school - love the sweet memories!!! Greetings! Love your blog, it is truly inspirational, thank you for sharing your life with us! 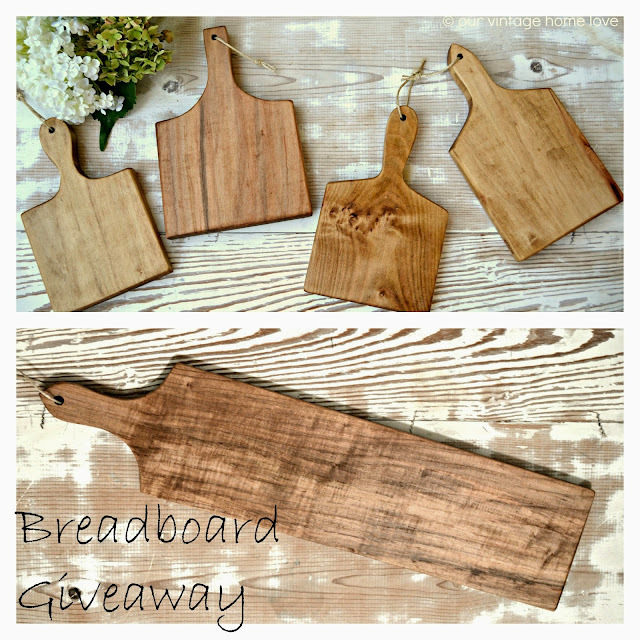 Your bread boards are beautiful, would love the chance to win them! My favorite thing about Fall is we finally see some cold crisp evenings in the Arizona desert! We love picking apples and pumpkins. I love walking up to the pumpkin patch and seeing all those round, orange guys just waiting to be taken home. So fun! I have two memories. First of all going with our to children to Hermanson's Pumpkin Patch. They had anything and everything and every color you could want. They also had a petting zoo for the children. It was such fun and they are the nicest people. My second one and one I cherish is my Father bringing eggs from a farmer friend for all of us daughters, and in the last fall he lived he brought donuts and we had coffee looking at the beauty of the fall. My favorite fall tradition was started this year...the Covered Bridge Festival in Indiana. Great food, yard sales, flea markets, covered bridges and beautiful countryside! Already planning our trip back next year! My favorite fall memory is from when I was 8 or 9 years old. I grew up in Minnesota and I had decided I was going to be a roll of toilet paper for Halloween (yes I was weird!). We bought hula hoops and taped white poster board to them with two holes out the sides for my arms, one hole on top for my head and left the bottom empty for my feet. It turns out this was the best decision ever and my costume was the envy of all the kids on the block...once it started snowing, and didn't stop. That Halloween it snowed 12-15 inches. While other kids were freezing, I was happily collecting candy door to door because I could be thoroughly bundled up under my costume! Fun times! What a lovely way to honor your dad. Going to the pumpkin patch with my kids and picking apples. Now I do it with my granchildren! What a nice thing to do! I've admired your bread boards for a long time and I think they are beautiful! My husband the the boys like to decorate our flag pole are with lawn furniture, cornstalks, baskets of wheat cuttings, gourds, pumpkins and mums. My husband gets this from his mother who is an avid decorator. We then sit as a family and take the annual picture! Such fun. Sorry about your father, I too know how you feel. My father has been gone for 27 years and I was just 19. My favorite fall tradition is taking a trip up to Oak Glen in late September or October. Oak Glen is a local mountain community full of apple orchards. I live in Southern California so fall weather is not something we are immersed in. But every year, we road trip up to Oak Glen to surround ourselves in the beauty of the season. We get to pick apples, visit the local orchards, sip cider, picnic, and enjoy the local activities and beautiful scenery. My fall is not complete without it! Big fan of your boards...what a great way to honor him. What a great way to honor him! Your breadboards are AMAZING!!! My birthday, along with many others in our family and some friends are all in the month of October, and as a kid we celebrated all of them together, and it is one of my fondest memories. Favorite time of year is Fall! As a child loved trips to the Michigan Apple Orchard/cider mill drinking hot cider and fresh warm donuts! Now that I'm grown with a family of my own my favorite tradition is taking the family to an open air Market Days weekend at a pumpkin patch with all sorts of fun for the family and great vendors with original handmade products! So sweet of you to share your love of your Dad and your bread boards! what a wonderful way to honor your Dad! My favorite memories are going on hayrides and coming home to hot cider and pumpkin pie that my Mom made. Now I live on the same farm and do these with my grandchildren. I am so thankful that I can pass on these memories. Your bread boards are beautiful! What a wonderful way to honor your dad. Your bread boards are beautiful. I'm sure he is proud of your work and creativity, and he's smiling down on you. What a sweet way to remember you dad and I so love your bread boards Diana! They will be very important to the lucky winner as well I'm sure. My favorite memory of the fall is Trick or Treating with my parents. I remember running to each door with my brother and sister. We have very happy memories of the dead-end street we lived on as children. I hope we are making memories that are equally as important to our children. Thanks for the opportunity to win the boards! oh my favorite memory is when i was a kid and would play after school outside until it got dark. i remember the crisp air, the days getting shorter, jumping in piles of leaves...ooo the memories. ah such a wonderful time! Tradition~I love putting little orange twinkle light down our walkway because it's not as scary as what our neighbors do every year (for the littler trick or treaters! I have for 15 years. Memory...Thanksgiving with as many relatives as will come! Love it! I have been thinking of my own dad, gone now 5 years, all day!!! I just love your wooden cutting boards. My favorite fall tradition is apple picking at the local orchard. My favorite fall memory is marrying my hubby two years ago!! It was a chilly October day but I had so much love and warmth in my soul because of the occasion! My favorite fall memory is of collecting twigs and fallen branches with my kids after strong storms. We were having a difficult time financially,and so after every storm we would walk around and pick up all the branches to burn in the fireplace. What could have been a dismal experience was made fun by my children looking forward to the time we would be spending together jumping in the puddles and seeing who could find the biggest branch. Your breadboards are a wonderful tribute to your dad! My dad was just diagnosed with cancer. His birthday is also in October. I would love to win these as a tribute to my dad, too. Our favorite fall tradition is Thanksgiving. This year will be our 34 th year of hosting this special holiday. When we started, only 3 of our 5 children were born. This year we will be surrounded by all 5 of our children and their spouses, our 7 grandchildren, and lots of extended family. This year will be bittersweet, though. It will be our first Thanksgiving without my mom, who is in a nursing home. I've been stalking your blog from Canada and you've inspired me to try to be a little creative :) Thanks. My favorite fall memory.... hmmm.... well, my husband and I were married in the fall and so every fall we get to celebrate and remember our cozy honeymoon in the cabin in the mountains with the leaves changing colors and the wood burning stove. Loved it! And we even get to celebrate it with my favorite holiday (next to Christmas :) ) which is Thanksgiving! Life is good. Hi Cute Girl! I LOVE your boards and think you have such talent. You are amazing. Wish we were neighbors! Anyways, my favorite fall memory would have to be trick or treating as a kid with my brother and Dad. We would use pillow cases as our "treat bag". We were serious and tried to get as much candy as possible! haha! We started at dusk and ran until sometimes 10pm. We had some good times! Every year my dad would drive us around...even when we were teenagers! Embarrassing I know. I looked little for my age and probably went trick or treating until I was 15! :) Now I have 3 littles to get my fix! So many great fall memories but the best is growing up in NY my dad raking leaves letting us jump in the piles even though he knew he would have to rake them all over again! He passed away in 2005 6 weeks after he saw his first granddaughter get married. Now that I live in Florida, I don't get to see those gorgeous colors of fall but every October and November bring back those memories. Not a day goes by that I don't think of the wonderful man my dad was! One of my favorite fall memories, and now our fall tradition, is going to the pumpkin patch and spending hours trying to find the perfect pumpkin, and then coming home to a hot bowl of chili. There seems to be a special relationship between a daughter and father. I can tell you love and miss him very much. My dad passed away over 30 years ago and I miss him every day. I have many happy memories of him. Guess those memories help me a great deal. Dad loved the cool weather. He always carved little pumpkins for my brothers and me. We'd rake leaves, burn them, and have a "weeny roast." He loved Thanksgiving and getting our family together. He adored his grandchildren and his children. We love college football in the fall. Even when we can't get back to Tennessee for the games, we love to get together with family and friends to cheer on our Volunteers. The Smokey Mountains are so beautiful this time of year. Every Fall we rake up a huge pile of leaves in our backyard....and then we pile all the grandbabies in it and take photos of them. Lots of laughing and leaf throwing goes on. We have a great time. This year will be our fourth year and the leaves pile will be filled with five grandbabies - ages 5 months to 5 years! What a blessing! Thank you for such a lovely giveaway...what a sweet way to honor your father on his birthday. Happy birthday to your daddy. I'm sure he would be happy about your way of honoring him today, so sweet! My fav thing to do in fall is decorate my house or get it all nice and cozy feeling. Warm colors, throw blankets and family movie nights with the fireplace on. Happy Birthday to Dad! So sorry for your loss..... I know how you feel, you never get over the loss of a parent. But, I have lived everyday to honor both of their lives and now their memory. They were the best people I have ever known, truly. Best Fall memory.....our family went to the mountains to pic nic when the weather finally got cool....hot chocolate and marshmallows, blankets, cold noses and ear muffs, remember those? Best to you and yours, thanks for the sweet giveaway in memory of your Dad. I loved living in Colorado during the fall. We often had snow and there would be times when the fog would freeze on the pine trees and they would look like they were sugar-coated. So pretty! My favorite Fall memory is captured in a photograph. My first born was about 11 months old when I snapped a picture of him eating a fist full of leaves while sitting in an antique wash tub. I placed the tub underneath our Dogwood tree after it dropped all it's leaves. It was the very photograph that started my obsession with photography. (The wash bin, by the way, was the same one my dad used to bath in as a baby....Dads are special. Happy birthday to yours, Diana). What a wonderful tribute to your father... Love cuddling up with a warm apple cider under the quilt with my puppies!!! Lovely story. My dad died last year from a long battle with Parkinson's and I don't think I will ever stop crying for him but I do have some amazingly fun memories of me helping/watching him renovate around us, or eating home-made apple pie together! I'm in Australia so can't "win" your beautiful giveaway but it's lovely of you to offer it to your readers. I grew up on a beach in South Florida. I thought my world was a paradise until as circumstances would have it, at the age of 42, I moved to the Blue Ridge Mountains northeast of Atlanta, just 4 miles from the North Carolina state line. While searching for a place to live, I borrowed my cousins' house on top of a mountain. In 42 years I'd never experienced a change of seasons, but I remember very vividly my first true autumn, looking out over that mountain view of miles and miles of patchwork color. I think I cried harder than I've ever cried in my life seeing something so magical. It was spiritually moving and as each leaf fell, a piece of my anger, doubt and fear fell along with it until I felt cleansed, refreshed and renewed. It was meant to be a temporary move, but I never went back to the beach. I can't imagine living without the sea of color here in the mountains, the fields of wildflowers, forests of red, gold, and orange, pumpkin farms glowing with color, plaid flannel shirts, and the scarecrow competition around the courthouse square. I've had 20 autumns now, but I'll never forget how that first one saved me and gave me a new life. What a nice way to honor your father! My favorite Fall tradition: every year my cousin hosts a weekend event for her family (she has nine brothers and sisters) and she includes my family as well. We have a big campfire, people bring campers and tents to sleep in, there's even a giant tent just for food. We sit around the campfire until the wee hours, then the next morning around 10 there's a big brunch. Some people come for the campfire; some come for brunch; some come for the entire event. Our kids have grown up with the event, and now there are grandchildren enjoying the fun as well. It's the highlight of my Fall. This is a lovely and generous way to remember your dad. Fall is my favourite season, and it feels as if there are so many great traditions to choose... I'll go with family trips to the countryside: hiking through piles of crisp leaves, relaxing in front of the first fire of the year, playing board games, and sharing "autumn foods" like pumpkin pie and hot apple cider. What a beautiful way to honor your father. We just celebrated our Canadian Thanksgiving surrounded by family; my favorite fall tradition. I love that you are attaching your memories of your Dad into your cutting boards. I think that is the reason so many of our items hold a special place in our heart. It's not the item itself, it's what it represents. I have many fall memories that we cannot do without. One is that it is the start of our Sunday family football gatherings after church. everyone in the family pitches in and comes to our house to watch the Big football game that week. We like to plan themed pitch ins which are loads of fun with loads of good home-cooked food. We live in a cabin in Northwest Indiana and so we include many big bonfires with smores and fall hikes. Good-Luck everyone. Sounds lame, but my twin sister and I would rake the leaves in our yard on the weekends, and my mom would be indoors and my dad would be working in the garage or helping us with leaves. Neighbors would be running their fireplaces so you could smell the outside. Then afterwards, when we went inside to get warm, we'd watch a movie together. Our house was always decorated for fall, so I guess the coziness from the decor helped with the atmosphere. Now, as an adult, I smile whenever I think of Oct/Nov. :) Thanks for the nostoglic moment! My grandpa used to say that fall was his mother's favorite time of year, because it was then that you could see the fruits of your labors.